Silver’s massive autumn rally has utterly captivated speculators and investors, their appetite for all things silver is insatiable. Interestingly a major driver of this metal’s recent surge was stock-market buying of the flagship silver ETF, SLV. The larger and more popular this fund grows, the greater its ongoing impact on silver prices. SLV was born in late April 2006, so it is relatively young as far as exchange-traded funds go. Though its birth was shrouded in controversy, SLV has rapidly grown into a smashing success. Now holding $10.2b worth of physical silver bullion in trust for its shareholders, it is already one of the world’s largest ETFs. And as more stock investors get interested in silver exposure, SLV will only continue to grow. And indeed the industrial silver consumers’ fears have come to pass. In mid-December 2010, SLV’s holdings hit an all-time high of 352.5m ounces of silver bullion! To put this into perspective, global silver production in 2009 ran about 700m ounces. American stock investors, by buying shares in SLV, have already absorbed the equivalent of half a year’s worth of all the silver mined in the world. Provocatively about 1/6th of SLV’s total silver hoard was acquired in less than 5 months between late-July and mid-December 2010. SLV’s holdings shot up 18.9% during silver’s massive 76.0% autumn rally we saw last year. This is no mean feat! The 55.8m ounces of silver this ETF had to buy over this short span is staggering. One of the largest primary silver miners in the world, Pan American Silver, expected to produce around 24m ounces in 2010. US stock investors, through the mechanism of SLV, snatched up 2.3x PAAS’s entire 2010 production in less than 5 months! This young ETF has already grown into a silver juggernaut, an irresistible force that every silver speculator and investor must keep a close eye on. Though physical ETFs have been around since the enormous GLD gold ETF’s debut in November 2004, unfortunately many investors still don’t understand how they work. The mission of an ETF is to track the price of its underlying asset, to mirror the underlying’s performance. Since real-time supply and demand determines all prices, this tracking mission can only be accomplished in one way. A physical ETF has to act as a direct conduit to move capital between investors and the underlying asset. In SLV’s case, this silver ETF and silver itself have their own independent supply-and-demand profiles. If you decide to buy 100 ounces of physical silver coins today, it doesn’t affect SLV. And if an SLV shareholder sells 100 shares, it doesn’t directly affect physical silver. So if capital wasn’t flowing back and forth between this ETF and the physical world, SLV would quickly decouple from silver prices and fail its tracking mission. Physical ETFs like SLV succeed because they equalize their own supply and demand into their underlying assets on a daily basis. SLV actually has to buy and sell physical silver, otherwise it could not track silver prices. And since its launch, SLV has tracked silver prices perfectly less its 0.5% annual expense ratio. For providing this valuable service, every year SLV’s custodians take a half percent of the fund’s assets to pay their expenses (including storing the silver bullion) and earn a reasonable profit. SLV has to buy silver bullion when stock investors are buying its shares at a faster rate than silver itself is being bought. This differential buying pressure on SLV, if not shunted directly into silver itself, would quickly lead to SLV decoupling to the upside (rising faster than silver) and failing its mission. So in these situations, SLV issues new shares (in huge 50k baskets). This mechanism is critical for tracking. Issuing new shares first adds SLV supply to the market to absorb the excess demand, which keeps SLV shares from rising faster than silver. SLV’s custodians then take the proceeds, the cash earned from selling these new shares, and plow it directly into silver bullion. This equalizes the excess stock-market demand for SLV shares into underlying silver itself. This silver buying drives up silver prices to keep them in line with SLV demand. Thus SLV shunts stock-market capital directly into physical silver. But opening a large conduit between the vast pools of stock-market capital and the relatively-tiny silver market is a double-edged sword. When stock investors sell SLV shares at a faster rate than silver is being sold, this differential selling pressure will force SLV to decouple to the downside. In order to prevent this ETF from falling faster than silver and failing its tracking mission, SLV’s custodians have to buy back shares to absorb this excess supply. Where do they get the cash? From selling some of their silver bullion. Again in huge blocks of 50k shares (each share represents one ounce of silver), SLV’s custodians sell however much silver is necessary to fund the buying back of enough shares to absorb the excess SLV share supply. This equalizes excess stock-market supply of SLV shares into silver. This ETF’s silver selling also drives down silver prices to keep them in line with SLV supply. So SLV can also shunt stock-market capital directly out of silver. Without this conduit, a link for capital to flow back and forth from stock investors and the underlying asset, a tracking ETF can’t work. So watching the flowing and ebbing of SLV’s holdings offers fantastic insights into how stock investors view silver. When they put differential buying pressure on SLV forcing it to buy silver, more capital is flowing into the global silver markets. When they sell SLV fast forcing it to liquidate silver, capital is flowing out. Thankfully SLV is super-transparent, publishing its holdings data daily. Don’t underestimate how radical so much disclosure is in the precious-metals markets! One of the main reasons conspiracy theories thrive in the PM world is because actual data is so hard to come by. In the case of gold and silver, fundamental data like supply and demand is heavily fragmented and often only available quarterly (and even then it is only estimates). So SLV’s daily holdings offer an unprecedented high-resolution read on a critical aspect of global silver supply and demand, how American stock investors feel about it. And as this chart shows, since SLV’s humble beginnings stock investors have grown increasingly fond of the white metal. As of its recent record high in mid-December, SLV’s holdings had multiplied by 16.8x over the short life of this ETF! With such a mammoth footprint today, no silver speculator or investor can afford to ignore this behemoth’s activities. SLV’s silver-price impact is already large and still growing. As you digest the massive growth in SLV’s holdings, remember that this ETF’s custodians only buy silver bullion when demand for SLV shares exceeds silver demand. And more or less continuously since April 2006, stock investors have been pouring ever-more capital into silver. Silver’s bull run over the past 5 years wouldn’t be anywhere near as big if stock investors hadn’t purchased 350m ounces of this metal. SLV was very popular right out of the gates, even though silver entered a sharp 35.1% correction just 2 weeks after this ETF was born. During the 5-week lifespan of that brutal silver correction, SLV’s holdings still managed to grow by 10.4%! This amazed me then, and still amazes me now. Prior to SLV’s launch, traditional silver-coin investors thought stock investors would be far more flighty and excitable than the existing silver crowd. The stock guys would be quick to sell SLV during silver selloffs, amplifying this metal’s already-sharp retreats. But that hasn’t been the case, amazingly SLV’s shareholders have actually proven some of the strongest hands in the silver markets! They rarely apply differential selling pressure, which has really made SLV’s holdings “sticky” during silver weakness. During most of 2007 as silver drifted lower, more stock investors flocked to SLV driving its holdings higher. Incredibly, SLV’s holdings actually grew through 2008’s epic stock panic. I would never have predicted this. Between silver’s July 2008 high and its panic low in November (on the very same day the stock markets bottomed), this metal plummeted 53.4%. It was a bloodbath! Yet SLV’s holdings somehow grew by 11.4% over this span, stock investors weren’t selling it as fast as silver was sold. Even in the scariest dark heart of that once-in-a-century fear maelstrom, SLV shareholders stood strong. While silver plunged 33.8% in just 9 weeks leading into the panic’s low, SLV’s holdings only edged down 0.6% over this span. The stickiness of SLV’s holdings (which means stock-market investors’ resolve) through that epic anomaly was incredible. As a group, SLV shareholders could teach traditional silver investors a thing or two about staying calm and believing in silver’s secular bull even through selloffs! The biggest risk SLV poses for the silver market is the vast additional supply it could add if stock investors start dumping it faster than silver. This would greatly amplify any selloff in already-volatile silver. While I know we’ll see such a monumental SLV selling event when silver’s secular bull ends, just after its popular mania climaxes in a vertical parabola, it is probably years away. This silver bull’s primary driver is gold, and the yellow metal’s own supply-and-demand fundamentals suggest its bull remains young. I highlight the behavior of stock investors as illustrated through SLV’s holdings during the stock panic to fight a popular Wall Street argument against silver. Silver bears like to make the case that a big differential SLV selloff is going to crush silver. And if one did happen, it would indeed. But the sheer stickiness of SLV’s holdings over the last 5 years, especially through the stock panic, argue against this thesis. If the biggest fear event in the global markets since 1907 didn’t ignite an SLV panic, then what will? SLV’s holdings surged again during the post-panic recovery in early 2009, hitting many new records. Interestingly this particular SLV surge was driven by a parallel surge in GLD’s holdings. A couple giant hedge funds aggressively bought a massive amount of the GLD gold ETF in early 2009. Many investors followed these elite hedgies into GLD and SLV, rightly betting that their underlying metals would rise sharply from their irrational panic lows. 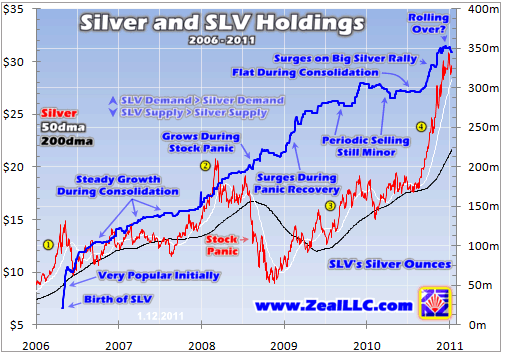 Between late 2009 and mid-2010, SLV’s holdings were largely flat despite the fact silver merely consolidated sideways. We did see some periodic selling when silver was drifting listlessly or retreating, but these SLV selloffs were minor. And finally stock-investor demand for more silver exposure exploded again last autumn as silver started rocketing higher. Without the 55.8m ounces of silver their differential buying pressure forced SLV to add since late July, silver’s recent rally would have been much smaller. SLV’s trading volume is also interesting, offering insights into when stock investors push the most capital through in equivalent silver volume. Since each SLV share equals one ounce of silver (less this ETF’s necessary administrative fees), it is easy to quantify when stock investors get the most excited about this metal. As I examined some of SLV’s major volume spikes over the years, the answer was obvious. 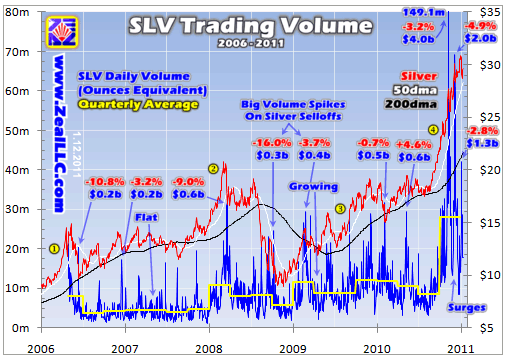 SLV’s biggest volume spikes, with rare exception, happened on silver selloffs. The red numbers above show what silver prices happened to be doing on days when SLV saw the most shares changing hands. The blue numbers show how much the equivalent silver traded was worth. It is great to see how much SLV’s capital volume has grown over the years, stock investors are gradually trading more silver. Back on one of 2006’s largest volume days, a brutal 10.8% single-day plunge in silver, 20.7m shares (effectively 20.7m ounces of silver) traded. But at silver’s closing price of $9.84 that day, they were only worth $204m. By March 2008 in another big silver correction, on a day when silver plunged 9.0%, 31.7m SLV shares worth $568m changed hands. SLV volume was gradually ramping up as more stock investors grew interested in silver. SLV’s volume peaked recently on November 9th, 2010 at a staggering 149.1m shares worth $3998m! That was the day the CME Group raised margins on COMEX silver futures by 30%, which sparked incredible silver volatility and unease. Though silver only closed down 3.2% that day, intraday it plunged 8.3% in just 3 hours. It was amazing to see an extreme volume day for SLV soar nearly 20x in capital terms over less than 5 years. The yellow line above is the quarterly average of SLV volume, and it was largely flat during 2006 and 2007 despite SLV’s holdings relentlessly rising. It started growing gradually in 2008, 2009, and early 2010. And then this average rocketed up to 28.0m SLV shares per day during last quarter (Q4 2010)! Interestingly, this is not totally due to that early-November superspike. If you take that 149.1m-share day and the next day (79.9m) out of the average, Q4 still ran 25.2m shares which dwarfs any previous quarter. Silver’s huge rally last autumn worked wonders for stock-investor interest, it evangelized the potential of silver investing like nothing else could. And given the stickiness of SLV’s holdings over the past 5 years or so, probabilities are very high that these new stock investors will stick around. It is great to have them, as the more capital that flows into silver from any source the higher its secular bull will ultimately power. With the biggest SLV volume spikes usually on big silver down days, you may wonder how SLV’s holdings can remain so sticky. SLV shareholders are obviously scared during big silver selloffs since they push through disproportionately-high numbers of shares. The key is differential. SLV only has to dump bullion to buy back shares when stock investors are selling them at a faster rate than silver itself is being sold. As long as SLV and silver are moving at the same pace, no bullion has to be sold or bought. So far, SLV investors haven’t sold their shares faster than silver itself was being sold for any sustained period of time. And as long as SLV remains relatively small, this trend ought to continue. Though SLV is large by ETF standards (and silver standards), it is vanishingly small by stock-market standards. The $10.2b of physical silver bullion it holds in trust for its owners is just 0.087% (yes, less than 0.1%) of the mammoth $11,685.8b of total capital deployed in the S&P 500 stocks alone. And this is where SLV will really shine in the future. What if US stock investors, in response to this powerful secular silver bull’s huge gains, decide to deploy just 1% of their stock capital into silver? If they do it via SLV, which is highly likely since this ETF is so efficient and easy to trade, then SLV could grow by 11.5x from here. Imagine what that would do to global silver prices! What if stock investors go to 2%? SLV, and indeed the broader silver market, remains vanishingly small compared to stock-market capital. So SLV’s silver impact should only grow in the coming years, probably dramatically. It is a perfect vehicle to instantly and cheaply add silver exposure to any stock investor’s portfolio. Stock commissions and SLV’s fee are trivial compared to the huge transaction costs inherent in physical-coin buying. SLV is also fantastic for speculators. Not only can they enter and exit instantly for practically nothing, SLV has a full options chain that allows leveraged bets on silver prices. SLV is a great boon to all silver investors and speculators. The biggest drawback for SLV is it doesn’t leverage silver. The best anyone can ever hope for in SLV is whatever silver does less 0.5% annually for this ETF’s fees. In a spectacular year like 2010 where silver rocketed 83.1% higher, this is certainly a heck of a deal. But in general, even last year, elite silver stocks can mightily leverage the underlying gains in silver. One of our long-term silver-stock investments soared over 1000% between when we recommended it in 2008’s stock panic to last autumn, compared to 200% gains in silver! So though I’ve owned and recommended physical-silver coins as long-term investments since silver traded near $4 in late 2001, and I think SLV is a super-awesome trading vehicle, most of my silver capital is deployed in high-potential silver stocks. Their gains over this secular bull have and will continue to dwarf silver’s. And unlike options, great silver stocks have no expiration dates and aren’t constantly bleeding time value. Silver stocks offer the best bang for your buck by far in this silver bull! At Zeal we recently finished a 3-month deep-research project on silver stocks. We started with the universe of nearly 100 trading in the US and Canada, and spent several-hundred hours painstakingly whittling them down to our dozen favorites. We published comprehensive profiles on each of the winners in a fascinating new 34-page silver-stock report. Ranging from large world-class silver miners to small juniors with amazing projects, these are the silver stocks we will trade going forward. You can enjoy the full fruits of our expert labors for just $95 ($75 for subscribers). Buy your report today! We also publish acclaimed weekly and monthly subscription newsletters focusing on uncovering high-probability-for-success trades in commodities stocks. We zealously apply our decades of trading experience and expertise to current market conditions to help you thrive in the markets. Our analyses are wide-reaching, well-informed, fascinating, and honest. Since 2001 in our flagship Zeal Intelligence newsletter, all 231 of our stock trades have averaged annualized realized gains of +47.5%! Subscribe today! The bottom line is SLV has become a juggernaut in the silver world, a force to be reckoned with. Silver investors and speculators, regardless of whether or not they own SLV, can only ignore this ETF at their own peril. Stock-market investors have aggregate pools of capital vast beyond imagination, and SLV opened up the first direct conduit in history between them and silver. The results have been fun to watch. SLV’s already-large impact on silver prices should only grow. Relative to their stock-market capital, stock-market investors’ silver exposure remains vanishingly small. Thus SLV has nearly endless room to grow more popular, shunting tens of billions of more dollars into the physical silver market. And so far, stock investors as a group have not been quick to dump their SLV shares even in big silver selloffs. This is a very bullish omen for SLV’s future impact on silver.